Come to the McFaddin-Ward House Community Picnic! 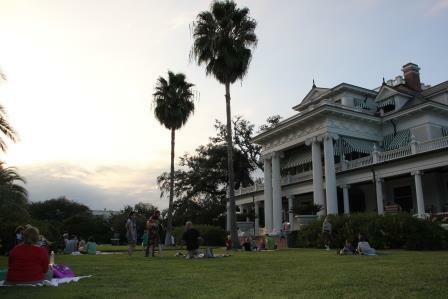 Bring a picnic, something to drink, and a quilt or chairs, and set up on the carriage house lawn. Enjoy a relaxing evening while listening to the sounds of Alternate Route, a well-known local group that blends the best in country, bluegrass, and southern rock. Take a free tour of the first floor of the main house and the newly painted carriage house. The picnic will also kick off two exciting activities! Join us for an encore of our neighborhood tour, “Our Town.” Walk, bike, or drive your way through what would have been the McFaddins’ neighborhood, stretching from 1st to 11th streets, from Smart Street to IH-10, to learn about the homes in this historic area of Beaumont. Look for the “Our Town” signage, which will be up through Thursday, May 2, 2013. A brochure with the participating houses will be distributed at the picnic. Visit our blog to read some of the stories already shared with the museum. Also, visitors will be able to take a tour of the newly-expanded victory garden and learn about the new program, “Roots and Shoots: Teaching Sustainable Living to the Next Generation”! The organic teaching garden, located behind the carriage house, is used to educate both adults and children about growing-your-own and making-your-own. During the event, there will be demonstrations on making seed balls and garden-fresh gazpacho. Contact us at (409) 832-1906 for more details.